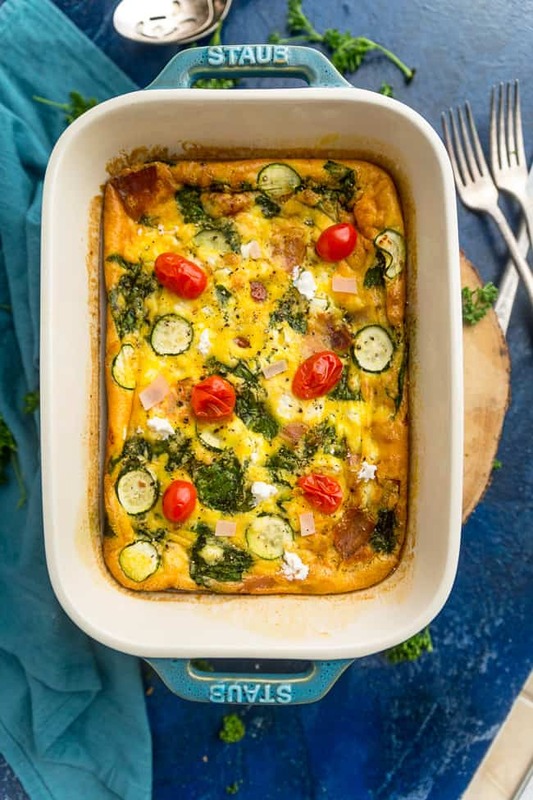 Whole30 Breakfast Egg Casserole – an easy paleo breakfast bake recipe made with spinach, zucchini and ham perfect for a make ahead breakfast or weekend brunch. Only 10 minutes to make and is low carb, gluten free, dairy free and Whole30 compliant. WHAT DO YOU EAT FOR BREAKFAST ON WHOLE30? If you’re looking for ideas on what to have for breakfast while you’re on Whole30, we usually have eggs for breakfast a lot around here. You can’t beat how easy they are plus, they’re full of nutrients, protein, low carb, paleo and keto-friendly. 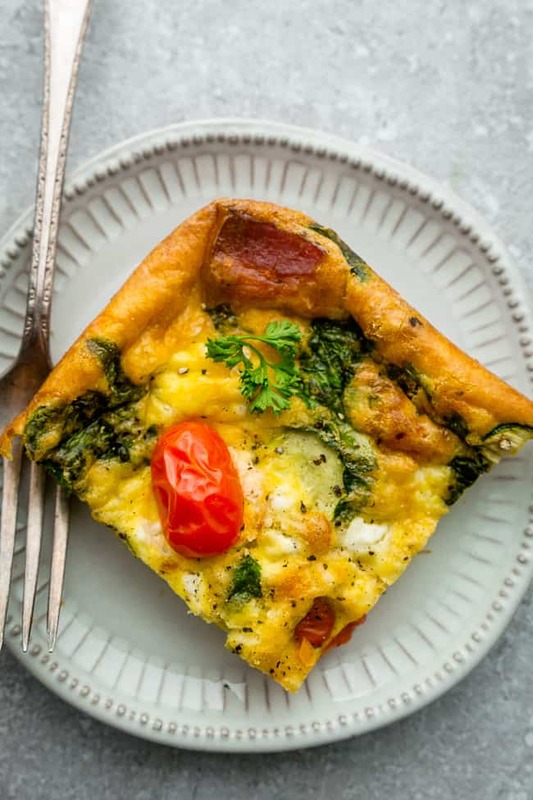 While most mornings we’ll warm up one of these mini Breakfast Egg Muffins that we meal-prepped over the weekend, a simple and quick Whole30 breakfast casserole is the perfect last minute breakfast option for feeding a crowd. Baking everything into a pretty casserole dish is a great way to fancy up breakfast for a special occasion like Easter, Mother’s Day and Christmas. You can’t beat how easy they are to make with just a few simple ingredients. Plus, easy breakfast bakes are perfect for serving overnight guests. Is sausage allowed on Whole30? Yes, you can have sausage on a Whole30 diet as long as it doesn’t have any nitrates or MSG, sugar plus any other unapproved additives. Aidells, Pederson’s Natural, Applegate and Teton are a few brands that have Whole30 compliant sausages. BEAT THE EGGS: In a large mixing bowl, whisk the eggs and coconut cream together. Season with salt and pepper along with any other spices or herbs you like. Smoked paprika, thyme or oregano would be great in here. STIR IN VEGGIES: Stir in spinach, zucchini, mushrooms and chopped ham. POUR IN PAN: Pour into a 9×13 casserole pan and top with tomatoes. If you’re not following Whole30 or a paleo diet, you can add the optional cheddar and goat cheese on top. BAKE: Bake for 30-35 minutes, or until set. 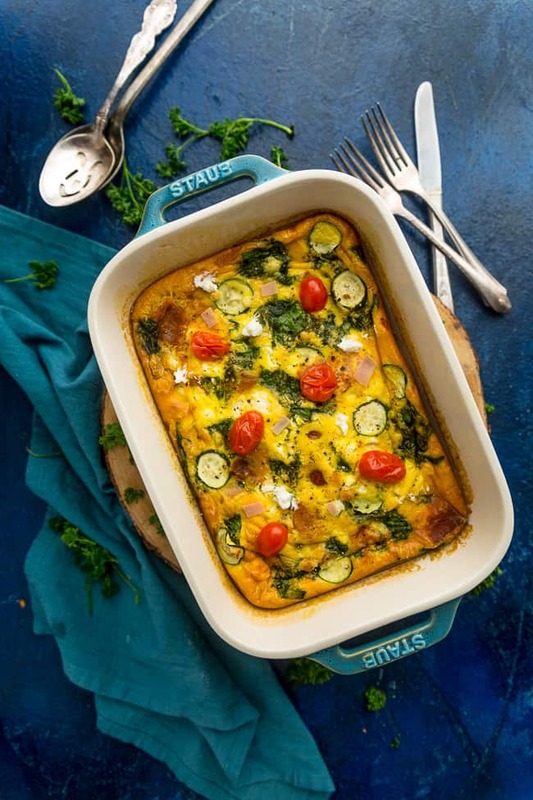 WHAT ELSE CAN I MAKE WITH THIS PALEO BREAKFAST CASSEROLE? This gluten free breakfast casserole is so versatile and would be great with just about any vegetable or protein you like. Feel free to swap the spinach for kale, broccoli, asparagus, peppers, mushrooms, onions or asparagus. And instead of chopped ham you can use cooked bacon, sausage or shredded chicken. 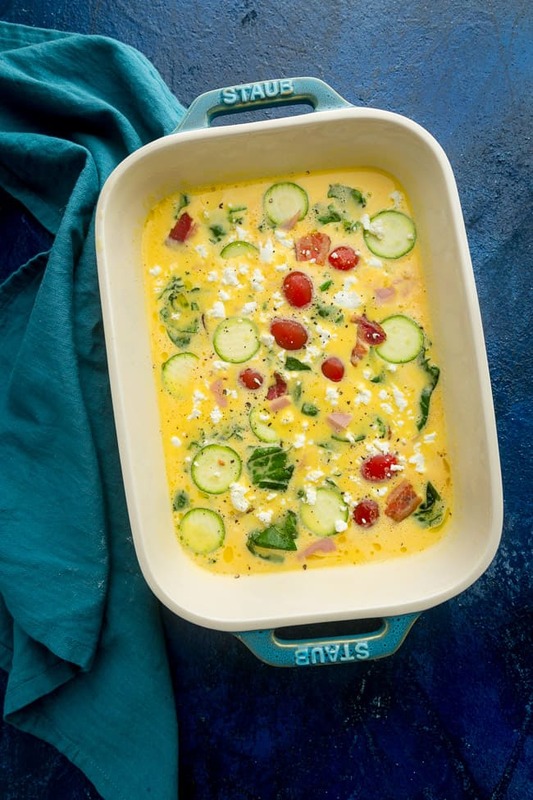 Can you freeze breakfast casseroles? Absolutely. 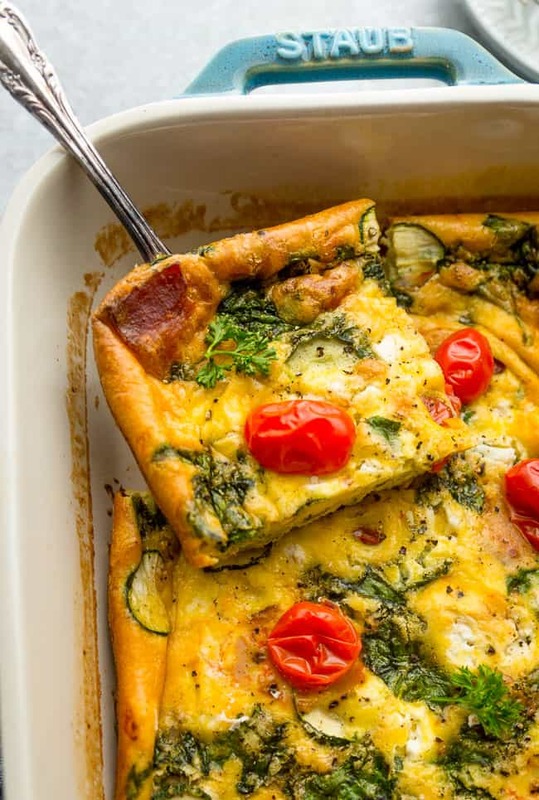 The great thing about this paleo breakfast casserole is that you can make it ahead of time and it is freezer-friendly. You can meal prep a batch on Sunday and portion it out into individual servings. Cut into squares or leave whole – wrap in plastic wrap and store portions in a large freezer bag or individual containers. HOW DO YOU REHEAT BREAKFAST CASSEROLES? To reheat, thaw and blot with paper towel and reheat portions in the microwave or whole in the oven at 350 F for 30-35 minutes or until warmed through. I love how easy casserole bakes are to customize. They are great for using up leftovers in the fridge and perfect for those that love savory foods for breakfast and brunch. This breakfast casserole is the perfect choice when you’re having guests over for a holiday meal. You can also make it at the beginning of the week and just reheat a square for a quick breakfast on the go. 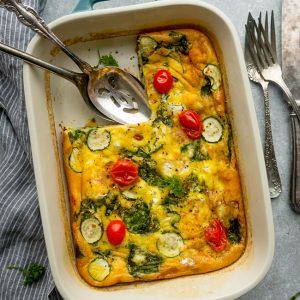 Whole30 Breakfast Egg Casserole - an easy and delicious breakfast bake packed with spinach, zucchini, ham and tomatoes. It's also low carb, paleo and keto-friendly and perfect for weekend brunch. 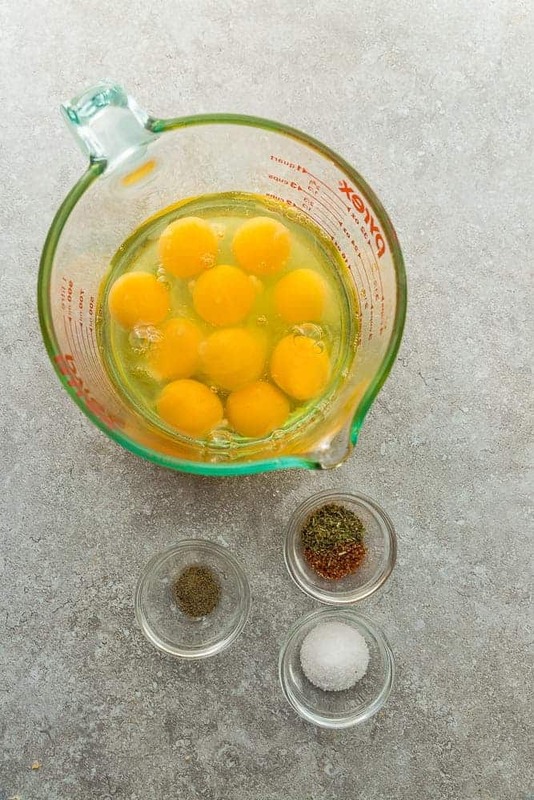 Crack eggs into medium-sized bowl. Add coconut cream and season with salt and pepper. Whisk until well-combined. Stir in spinach, zucchini, mushrooms and tomatoes. Spray a 9x13 pan with avocado or coconut oil cooking spray. Pour egg mixture then top with more tomatoes. Add cheddar, and goat cheese if using for non Whole30/Paleo. Bake for 30-35 minutes, or until eggs are set and not jiggly. Remove from oven once edges of casserole are golden brown.